206/365(+1), a photo by Luca Rossini on Flickr. 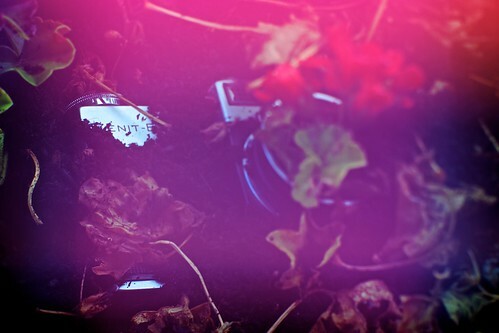 I buried my zombie Zenit-e, it’s now covered with soil and a flower grew out of its broken lens. Or maybe I seeded my father’s first slr, to see our legacy bloom, waiting for the day I can gather the crop and prosper out of it. Whatever it is that I did, being it metaphorical or symbolic, fact is, the old Zenit is there, and today I wanted to shoot it. And I wanted to use the nokton. Now, as most of Voigtlander lenses, the nokton has quite a long close-focus distance. If I recall it correctly (I’m too lazy to walk over the lens and read it, or even look for it on google, which however would have taken me less time than writing this whole sentence), it should be around one meter. I can’t shoot the Zenit from one meter because I want to take it from above and because to do it I should use a ladder just beside the edge of my terrace, and since I’m staying at the eight floor, there’s no way I’m going to climb over a certain deadly fall. So, I need to reduce the focus distance. Which is not impossible, but actually pretty easy, if you know the basic of optics. 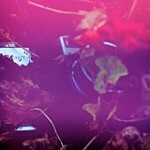 Essentially, further you bring the lens, closer you focus. So, you detach the lens from the body, and slowly move the lens further and further, till you get the focus you’re looking for. The tricky part is to stay still with both hands, the one keeping the camera and the one handling the lens. However, when the distance from the lens and the body goes beyond a certain point (and it does very quickly), you get light leaking through the mount, and vintage-weird magenta shades on the picture. Also, (and to do this last trick it is better if you unmount the ring adapter, so you have more freedom in changing lens position) if you don’t keep the lens perfectly perpendicular to the sensor, then you have weird-tilt-lens focus effects, since you focus plane doesn’t coincide with the sensor anymore. 3) misalign the focus plane on the sensor, in a tilt/shift lens fashion. Wow. This is one of my favourite shots of your entire collection (yes, I have gone through it all). I have the Nokton Classic 35mm f/1.4 and its minimum focussing distance is 0.7m, which can be a complete pain sometimes. I'd never even considered removing the lens from the camera (for fears of dust contamination) but now I can't wait to get home and try this out! Also, I assume you use contrast peaking? What settings do you use? Low, Med, High? What colour? And do you ever shoot in RAW but with scene set to B&W – resulting in a very obvious plane of focus, but a RAW image for later? Hi Martin, thanks for the comment! I use contrast peaking, it is set to white (I get confused by colors during composition) and to medium (but it's true that every lens has it's preferable settings). I only shoot in RAW, never set to B&W (again because I compose for colors other than just shapes). Anyway, with this trick you don't even need contrast peaking, the focal plane gets pretty obvious since it's “sliced” (due to the inevitable misalignment between lens and sensor).